Linda’s team of supervisors had excellent technical skills and a full commitment to their organization and its mission. And yet, when it came to truly collaborating, they were at odds. Each member preferred working in his/her own “silo” or individual projects. Some members were aligned with each other, but conversation and sharing at group meetings was guarded. This lack of trust prevented them from sharing innovative ideas. Although conflict and tension can sometimes add to the creative process, they all too often waste time and energy—yours and your organization’s! 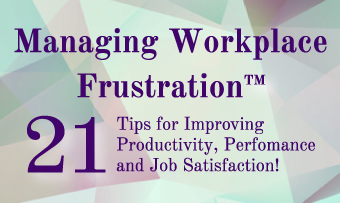 Interpersonal conflict can cause resentment, low morale, missed deadlines, and disengagement! Even worse, negative attitudes can become contagious! Misunderstandings often require intervention by a supervisor. When colleagues are drawn into taking sides, everyone wastes more time. After Linda’s team learned about different behavioral styles and the strengths of each of them, Penny learned when to tone down her direct and decisive behavior, Joshua and Ellen learned how to better assert themselves, and Paul saw how important his opinions were to the group decision-making process. Pat was better able to articulate her need for concrete results, and Linda came away with a team whose members truly supported one another!